The worker suffered a leg injury and taken to hospital by ambulance. 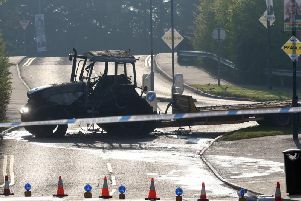 Part of the road where the collision occurred was closed for a time and a number of ‘Road Closed’ signs were displayed on various parts of the road. The police appealled to motorists to obey the road traffic signs currently being used in the area. They said that alternative routes were available, and they would be be keeping a close eye on this issue over the coming weeks and anyone caught breaching traffic signs will expect a hefty fine, penalty points or a potential trip to Lisburn court.